When I started out on Steemit , there was hardly not much tools around for Steemit. I remember one of the first tools I found easy to use was MinnowBooster. I used to delegate my steem power thru its innovative market place and that helped me increased my Steem Power significantly so I could be able to help my community more. Just a month ago I revisited MinnowBooster again and to my surprise I saw it has matured so much. One of the new feature which caught my attention was Vote-Selling . he could upvote other people using the balance as a form of support. The final option was to just withdraw whatever he made from staking his votes. SO I GOT HIM INTO VOTE-SELLING ! I realized that delegating when the price is low does not make much sense and I seemed to get better returns from selling my votes. Not only that you will get better returns but you will also be able to promote not only your post but any of your community members posts just to help them out. Once you login, you will see Vote-Selling in the menu after clicking My Account . You will then be brought over for you to authorize your account. Go ahead and authorize your account if you want this to be this main account to sell the vote. Once you have done that, login and now you have to do some settings for your Vote Selling. 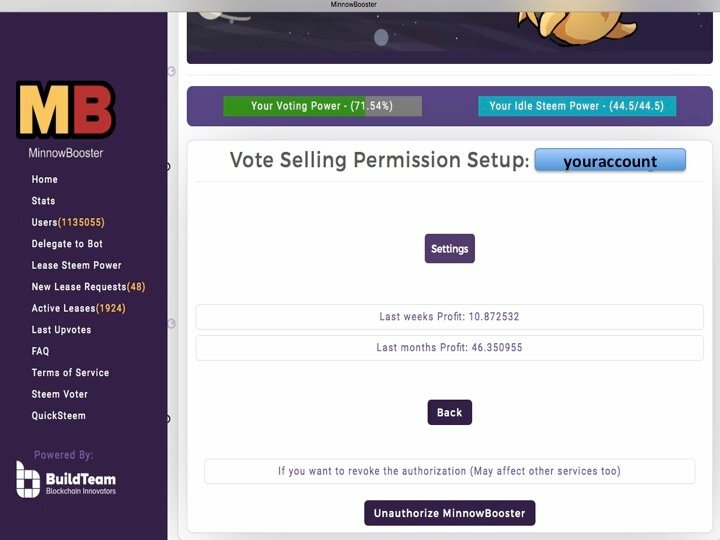 Once more click into Vote-Selling option and your screen should now look like this after you have authorized MinnowBooster to use it. You can leave these settings at default except for the bottom slider which states Sell your vote when VP above . This value is based on your percentage of your voting power . This is so that all vote selling will stop the minute you go below the stated percentage ! It would then wait till you get above this percentage before it commence vote-selling again. Here are a few TIPS ! Do not do this if you have a trail. Your trail will not benefit and its just plain rude for selling their votes without their permission. Besides, only the authorized account will earn. 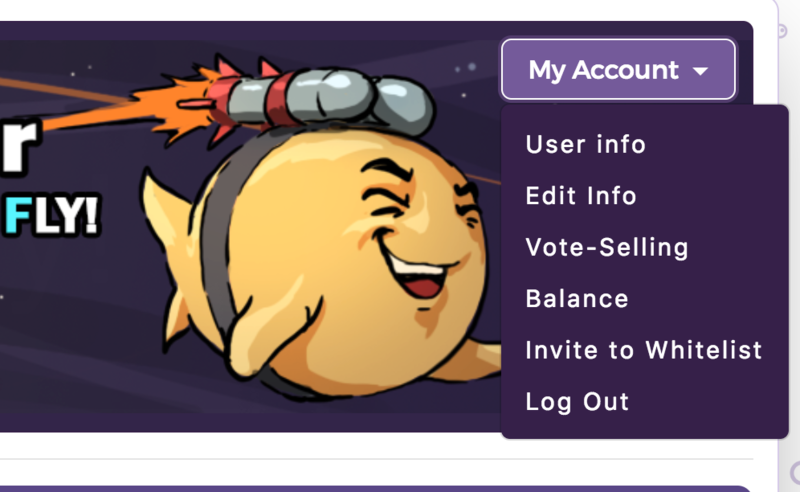 You can withdraw your SBD anytime you want, however you would benefit more from just upvoting your post or your friend's post. 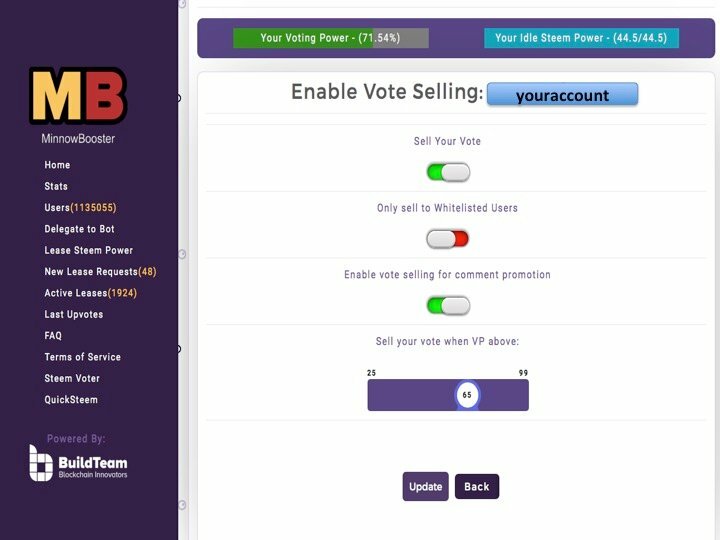 This is a great feature from MinnowBooster if you have dormant accounts which you would like to just gain from selling vote. With you selling your votes, not only that account gets to profit however you are indirectly helping others as well. MinnowBooster maintains a blacklist shared with Steemcleaners and other upvote services so that your votes will not go to spammers or anyone who has been reported to MinnowBooster. Should you vote-sell ?? That is something which you should decide on and its based on how active you are on the Steem Blockchain ! Another great tool MinnowBooster and BuildTeam has provided the community with is the Delegation Leasing Market. The DLM allows you to lease SP at your chosen rates and even fill SP at high APR % amounts as per the below example. Cheers and hope this short tutorial was helpful for you ! Have a brilliant weekend ahead ! 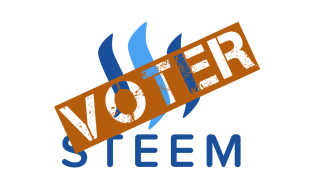 Congrats you have been selected by the Steemvoter (SV) Guild, keep up the good work you make Steem great! Note: You should receive many guild votes in an hour or so, enjoy! Steemvoter doesn't work currently for my account. Can you please check and fix this? Das funktioniert bei keinem Account seit Tagen wie du bestimmt mit bekommen hast - Steem Freeze, HF20 - 19 bugs - aber soll bald wieder gehen habe ich gerade gehört. Er geht wieder - yippee große Freude!! OK when you have enough SP to sell your votes its all clear. But when you just a minnow and your vote costs almost nothing (let's imagine that you have only 20SP) what to do then? It will take you many times to receive enough Steem to promote your post. OK. Thank you for your answer! Very interesting, I hadn't heard of this. Thank you for posting about it. Yes mate, I also use bote sell, but I use steemit a lot so it is not a beneficial process for me. But tjose who have a decent reputation/sp and dont come to steemit very often can use it , it will be a good gain for them. its mostly for those dormant accounts . i've seen many steemians who just left and with thousands in their accounts not doing anything. might as well do something about it right ? Absolutely... They are Building something better from scratch ! Good seeing this.. Thanks for sharing. Or you can go to @steemflagrewards and get a better return on your votes for downvoting spam. Your UA account score is currently 6.429 which ranks you at #166 across all Steem accounts. Your rank has improved 1 places in the last three days (old rank 167). In our last Algorithmic Curation Round, consisting of 434 contributions, your post is ranked at #2. Congratulations! I think vote selling is a great way to earn passive income. I think you hit the nail on the head with your comments about curation trails and vote selling. I don’t think you disclose that to your trail at a minimum. with a trail on you , you should not be selling votes at all . this method is seriously great for those with dormant accounts . I agree on both points. If you had enough SP you might be able to create a very nice passive income stream. Kinda like dividends on stocks.